YAY!!!! We’re up and running again. You never realize how much you use the internet until you don’t have it any more. I even rely on it to get my recipes for dinner some nights. I had all the ingredients Monday night for a recipe that I found online but then couldn’t make it without the internet. Darn. So, my latest creation has been a fun one. (come on, which ones aren’t fun?? haha!) I have seen homemade wipes cases all over the place. (and directions too…..just google it, you’ll see) So cute. Nice and chic. Yup, everyone’s got one. But I have 2 kids in diapers: a boy and a girl. So I couldn’t decide whether to make it girly or boyish. Then, I decided to make it both. 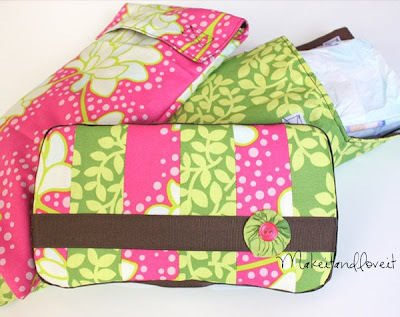 Along with some diaper cases…..one for each child in the coordinating fabric. ***Adjust quantities if you only want one diaper case. ***Also, measure your fabric and decide where you’re going to cut what, before cutting. You don’t want to waste fabric. First of all, I am using the Huggies brand diaper wipes portable case. (If you can’t find any at your local stores, here’s a LINK to some on Amazon.) Measuring along the top, down to the middle of each side, I decided that I needed pieces of fabric that were 9 x 5 inches. So the diaper case, if you’re not sewing strips together, is pretty fast and simple. Just cut out a piece for the top and bottom that are 9 x 5 inches and then skip the next part. If you do want the strips, cut 3 pieces of 2 x 5 inch rectangles, in each color. So you have 6 strips total. Sew them together, using a 1/4 inch seam. Iron flat. Now, cut out 2 pieces of felt that are 9 x 5 as well. Glue your piece of felt to the top of wipes case, being sure to center it in the very middle of the piece of felt, and then trim around the felt. The felt doesn’t need to go down the sides at all. It serves its purpose of covering up that center opening thingy (you know what I’m talking about?) and makes the top slightly softer. Also it hides the glue marks. Then hot glue your top piece (your stripped together piece or your plain one) on top of the felt. TIP: Just glue a little bit at a time so that your glue is nice and hot while attaching the fabric to the felt, creating a secure hold. Trim this fabric as well, but a little longer, making sure that it almost reaches the middle of the sides. Do the same thing to the bottom. And it’s okay if it’s not perfectly straight or doesn’t line up with the middle exactly. See look, here’s mine. Don’t try to perfect this part…..it’ll get covered up anyway. Then attach a wide piece of ribbon to the top, making it just as long as the fabric. Then glue some thin ribbon around the upper and lower edge, hiding all of those edges of fabric (and your ends of wider ribbon). Take your time and only glue a little at a time, to make sure your are attaching your ribbon to HOT glue. This will help it stay in place permanently. Just don’t burn those little fingers. Ouch. I started and finished at the back, to hide the ends. Oh yeah, glue (or you could hand stitch) some embellishments to the top. I added a fabric yo-yo from this project and a button. I’ve realized you can use these little yo-yo’s on anything. Cute. Okay, on to the case. Cut out a front piece in your outer fabric and your lining fabric. And a back piece in both as well. So you’ll have 4 total pieces of fabric for one case. If you’re making two diaper cases like I did, cut out another two pieces of the front and two pieces of the back. Go it? Then sew along the sides and the bottom, where the two fabrics meet. Do the same thing to the lining. That extra section of pink sticking out, will become your flap. Ultimately, what you’re going to end up doing, is attach the lining with the outer fabric at the openings, with right sides together. You’re not going to sew it closed completely, so that you can turn it right side out. So, place your front piece and your back piece together, with the right sides of the top flap together. Pin the two flaps together. Now, be patient with your fingers (and me) with this next part. You’re going to also pin together the sides (where they meet at the seam), and then your fabric jets out at a 90 degree angle. Pin it here (where the front opening/lip will be on your finished product) as well as about an inch in on each side. Your going to leave the rest open, so that you can turn it right side out. Sew all along here, taking your time to match everything up. Here’s a picture of the front opening. ***If these pictures are really confusing at this point, check out this post here. I made the Electronics Cozy the same way but just a smaller version. The concept is the same, I just showed a different way to do it. (Sorry, back to the pink) Be really careful while sewing the corners where that front opening meets the lining. I’m not talking about the corner on the flaps, though those should be precise too. I’m talking about 3 inches down, where the front edges meet. Make it a nice crisp corner or it will look sloppy when you’re all through. Up a little closer, here’s the corner I’m talking about. Also, make a diagonal cut, almost to the thread. This will help everything lay flat when you turn it right side out. Now trim all of your corners, so that when you turn it right side out, your corners will look crisp. Don’t know what I’m talking about? Sorry, I didn’t take a picture. But here’s a picture from the nursing cover tutorial. Okay, now turn the pink (or green) piece right side out, sticking a pencil down into the corners, to poke them out nicely. Then shove the the lining (brown in my case) down into the outer fabric. It should look more like a case now. Fold down the fabric at the opening and pin it into place. Iron if necessary. Now, you’re going to sew all along this opening, really close to the outer edge. Then, attach your velcro to the flap, and the front opening/lip. And you’re done. If you’re anything like me……you probably have several diapers swimming around your diaper bag. Annoying when you’re in a hurry to find the right diaper. Now they are tucked away in their little cases, ready for a quick bum change. Perfect, really. I love it! I need it! If only my 12 year old sewing machine didn’t act like it was 12 years old. I will have to do this one in May! i love the diaper cases! my brother and his wife have two in diapers as well , a boy and a girl and their 2yr old will get the diapers for them from the diaper bag and they are constantly trying to help him figure out the difference between a size 4 and 5 lol this would be aweosme to color cordinate it! You are one creative momma! I love your blog, it is so adorable. You are flowing with creative ideas, I love it! By the way, I did check out Etsy, I will call and come over, I would love to buy the red and white polka dot and also the turquoise/sea green circley tie (do you know which ones I mean?) Let me know! Thanks!!! Once again super cute! What a girl! Ashley! Holy Cow it has been forever! You might not remember me. It has been a long time since the college days at Colonial. How are things with you? Love your blog, I found it on another friend’s blog…small world! CUTE! Please tell April and Robin hi for me! So today at playgroup I was telling everyone about your blog, but I didn’t use the name. Then someone else said they liked one called “Make it and love it” and I said “That’s the same one!” Crazy! They loved your dry erase board. You’re all over the place! So cute! I really want to try this. My question is how do you have the time to do all this with 2 kids (especially two that are young enough to both be in diapers!) You are my hero! I've been trying to figure out the best way to make one of these & I found your blog today & now I'm a follower. Thank goodness because I'm actually working on baby projects right now & have been wanting to make one of these. Thanks & hopefully I can be smart enough to figure out the directions. LOL. You kill me, you are soooo talented. Love your blog! I am addicted to it. I want a sewing machine so bad, hope to get one soon, you are very inspiring. Thanks!!! Dang you are so talented! Super cute. So cute! Just another thing I have to add to my list of to do’s! I gave you a fun little award. Come over to my blog and check it out. I love, love your blog, I want to make one of these, where did you get your so cute material at? I have been searching far and wide for a pattern like this! Thank you so much for sharing. I dont have any in diapers but make lots of baby gifts so finding this was so helpful! I made one tonight, love it! Your directions were right on and easy to understand. Thank you again! Okay. So I made the diaper & wipes case yesterday and they turned out great. I've been wanting to make them since you posted. I posted a picture on my blog! Thanks for all your hard work and sharing all your amazing ideas! Love this and the instructions are well written! I was wondering if Aleene’s Tacky Glue or Fabric-Tac can be used instead of hot glue. If not, can low temp. hot glue work? I’m not sure about the other glue’s that you mentioned. I’m sure the low temp glue gun would work just fine. And if the other glues can be used on fabric and plastic (maybe it’ll say on the container) then it will probably work fun. Glad you found a fun project to do. Marcy, I sent you an email. i made one already and it turned out great. i want to make a few more for baby gifts but i can’t find the actual cases anywhere!!! help! Thanks Ashley! I ended up buying a new glue gun and did my first one today. It turned out good except I am not very experienced with hot glue and it was too thick in some areas. Need to practice! Mary, I found the cases at the Dollar General Store and I also think I saw them at Winn Dixie. Mary, I found mine at wal-mart but I guess there are some at the dollar stores (like mentioned). I also know some people have found them online (mine is a huggies brand case). So maybe you could buy several to make it worth shipping. Vanessa – YAY!! Glad you made one. And yeah, glue gun’s are tricky sometimes. Ashley! This is Lindsay Van Allen. How are you doing? A friend directed me to your website and I was like "Hey I know her." I love your crafts, especially this one, I feel like I am forever digging in my diaper bag to find a diaper! I hope you and your family are doing well! Thank you so much for all your amazing crafts on this website! You are SO creative! I am working on the diaper case and am stuck! The part I am stuck at is right here "Now, be patient with your fingers (and me) with this next part. You're going to also pin together the sides (where they meet at the seam), and then your fabric jets out at a 90 degree angle. Pin it here (where the front opening/lip will be on your finished product) as well as about an inch in on each side. Your going to leave the rest open, so that you can turn it right side out. Sew all along here, taking your time to match everything up"
1. What do you mean 90 degree angle? 2. I have sewn the lining and outer pieces together 10 times and had to take them apart becuase afterwards, I can't figure out how to finish sewing the raw edge after I have the flipped the right way! I am sure I explained it confusing, but if you have any tips, I would greatly appreciate it! Alisa, I bet you're ready to chuck that thing out the window! :) So sorry. Now, the 90 degree angle is referring to the fabric. As you place to lining and the outer fabric together, the flap comes together with and main part of the case at a nice corner (or 90 degree angle). So just pin the two flaps together, and then where they meet at the corners and then place another pin at each side. You won't pin all along the front opening of the diaper case because you need to leave it open to be able to turn it right side out. Gosh, it's so wordy, I know. I hope that helps a bit. Now remember, you need to clip little lines into the corner sot hat when you flip it right side out, it lays flat. Then turn it all right side out and you will just tuck the raw edge in and sew it closed as you are sewing around the entire opening to finish it off. I really hope that helped and if not, let me know. I am also very confused at the same part as Alisa. Its just not coming together right. Even after your further explanation. I'm just not exactly sure where I'm supposed to pin my flaps. Do I sew one inch into my opening? Your picture just don't seem to match up to the description. So you have your 2 separate case pieces, right? The outer fabric and the lining. Turn the outer fabric section inside out. Then slide the lining (that is right side out) inside of the outer fabric. Match it up so that the flaps are on the same side. Now, are your fabric's right sides together? Are the right sides (meaning the right side of the fabric) touching each other? If so, then pin the flaps together and then side seams, and also the front. Sew all the way around the flaps and part of the front, making sure to leave a few inches of the front open. Then you'll be able to turn the diaper case right side out. Before turning it right side out, clip the corners (by the side seams, where the flaps and the front section meet) so that it will lay nicely after turning it right side out. I hope that helps. Sorry this has been so confusing for some of you. Thank you Ashley. That was a very fast response! I'm sorry its been so confusing too. I'm a beginner at this sewing thing. Only been doing it for 3 months, so I'm stuck in this "visual" phase. But that explanation makes more sense to me now. Thanks again, I'm in love with your blog! No joke I have a huge "to do" list now and I just found your blog yesterday. PS. I live in Seoul, South Korea, so your blog is making it international :) In case you didn't already know. I had the same issues as Alisa & Katie…but I think it was just a visual thing. If I had thought to check the comments as I was making it, I probably could have figured it out! I ended up just hand stitching the raw edge up. I posted pics on my blog! :) Thank you for the tutorial. Thanks for the tute! I just finished 2 of them! One for my 20month old and another for my 3month old! I made the one for my 3month old a little smaller for her small dipes! I can't wait to make more! Super cute & super easy! I wanna do all your tute's! Your super creative! Made the wipes case the other night and it turned out so cute! I haven't been "crafty" since my first baby arrived in August. This definitely got the juices flowing again! Thank you! This weekend I will tackle the clutch…. Awesome tute, thanks!! I just made a couple of these and thought I'd add a suggestion for the pouch, at the part where you turn the top flap 90 degrees and sew in 1 inch of the front edge. When both sides are still inside out, iron the edges over so that they match perfectly. This will give you a line to stitch in the 1 inch part as well as make it easier to top stich when the pouch is right side out. Also, I cut the corners of the flap of my pouch off and made the flap taper. This allows for just one strip of velcro. Just another way of doing it. Thanks again, I love them!! Could you tell me what the fabric is? I love it! Gosh, I don't even remember what that fabric is called. I think it was an Amy Butler fabric or maybe Michael Miller….but I honestly cannot remember. So sorry….I only have scraps of that left, and none with the brand still marked on it. I found your blog a couple of weeks ago and had a long list of things I wanted to make for a baby shower this weekend. (Too much, when I was also making the cupcakes and a lot of the decorations myself.) I made both the wipes case & the diaper case and they both turned out awesome. The wipes case was passed around to everyone at the shower. My friend wanted Noah's ark and I found some great Debbie Mumm Two by Two fabric and used different patterns for each. I had also found some little ribbon giraffes on clearance at JoAnn's but because the colors clashed with the fabric, I looked at it and made my own of ribbon that matched. These were very easy, my only issue was the front corners of the diaper bag because of the multiple layers of fabric right there. I was able to fix it, it still wasn't perfect, but acceptable. I also tried the cloth rings, I didn't like the way the first one looked when I sewed it shut, so she didn't get those today, I'll probably finish it & give them once the baby comes along with a couple of other items. I was searching for a tutorial for a wipes case and yours came up at the top in Google- I'm so glad it did! I made this last night with scraps from a quilt I'm making for the crib and I LOVE it! I showed it to all of the girls at work and they thought it was so cute. Thank you for your directions. I'll I had to do was skim through them at work and I did it last night in about an hour. You explained it so easily! I loved this. I made the diaper clutch a little bit wider so that I could fit the wipe clutch and diapers together. Thanks your fun ideas. can you do this without a sewing machine? OMG! I love this. I just made a set for my diaper bag. I used the same fabric for both bags so I embroidered their first initial onto the front before sewing it together. They came out so cute! Thanks for the idea! Thanks for the clear instructions! All the other instructions I’ve seen to cover plastic wipes cases used quilt batting on them, and I really didn’t want to put that much money into it, but the felt worked fine! I think I’m going to try another one now and hot glue a little piece of elastic on the inside to hold my toddler’s crayons and a small notepad or some index cards for him to color on. I did this without a pattern (challenging!) But discovered that using some adhesive spray for the fabric helped a lot! Then I’d hotglue the places that needed it. I love this!! What size ribbon did you use for the edging of the wipes case? Love the tutorial! I just made the wipes case. I wanted a wet bag to match so used another tutorial for that, but wanted to say thanks for your time & effort! I linked to you in my blog. Your instructions are soooo easy to follow – easier than some videos I have seen. I was a dummy and wasted a yard of super cute fabric before I got the pattern just right (before I found your site). I want to make some covers that are one piece, which allows the top hinge to now show at all. I went to a fabric store today and a salesperson gave me some pointers and I bought some thin batting that was on sale. I have sewn a long time so i have a ton of scrap material. The problem I was having was getting the pattern just right, it was either too short or so long I spent a lot of time cutting not only fabric but my fingers as well! I was also using a LOT of glue and have shredded finders to prove it! OUCH! ANYHOO – thank you soooo much for your very easy, clear instructions and GREAT pics to back them up. It’s 7:30 pm and I need to make 4 before a craft show tomorrow morning. You have a GREAT eye for colors. I like to think outside the box and put pieces together hat people would go “hmmmmm'” at first, but when they see it together the liked it. I know you do the same. I am going to pin your site and and mark this as a favorite on my toolbar. I just made this and it is so super cute! However, in your top finished picture you can still see the little clasp, but in your bottom pictures it looked like you covered it. How did you do that? The plastic poking out is bothering my OCD mind!! Lol! a site or if I have something to contribute to the discussion. I would like to know; Why didn’t you sew the lining with the outer fabric together from the begging and flip them right side out together? Wouldn’t it be easier? I guess my question is silly? Right?! !